Three other species of large mammals are already extinct in the Sahara desert, the study’s authors report. An antelope known as the Bubal hartebeest is extinct, the scimitar horned oryx is extinct in the wild, and the African wild dog no longer inhabits the Sahara desert, according to the research led by New York’s Wildlife Conservation Society and the Zoological Society of London. Other species have fared only slightly better. 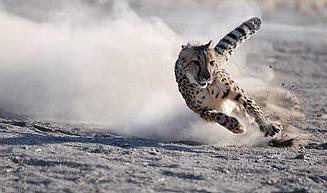 The dama gazelle and addax are gone from 99 percent of their range; the leopard from 97 percent its historic range, and the Saharan cheetah from 90 percent of its range. Only the Nubian ibex still inhabits most of its range, but even this species is classified as Vulnerable due to numerous threats, including widespread hunting. For the study, more than 40 authors from 28 scientific organizations assessed 14 desert species. They found that half of those are regionally extinct or confined to one percent or less of their historical range. 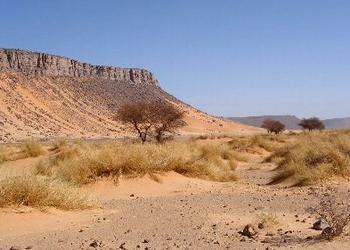 The Sahara is the world’s hottest desert, and the third largest desert after Antarctica and the Arctic. At over 9,400,000 square kilometers (3,600,000 sq miles), it covers most of northern Africa from the Red Sea, including parts of the Mediterranean coast, to the Atlantic Ocean. A lack of scientific research in the Sahara due to past and ongoing insecurity makes it difficult to be certain of the causes of these declines across the Sahara, although overhunting has played a role, the authors explain. Until about 10,000 years ago, the lion was the most widespread large land mammal after humans, found in most of Africa, across Eurasia from western Europe to India, and in the Americas from the Yukon to Peru. 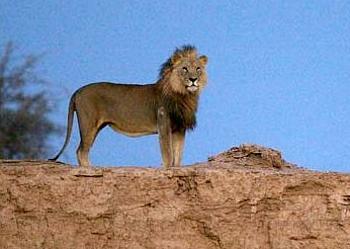 Most lions now live in eastern and southern Africa, but they are disappearing. Estimates of the African lion population range between 16,500 and 47,000 living in the wild in 2002-2004, down from estimates in the early 1990s as high as 100,000 and up to 400,000 in 1950. Primary causes of the decline include disease and human interference. Habitat loss and conflicts with humans are considered the most serious threats to the species. “The Sahara serves as an example of a wider historical neglect of deserts and the human communities who depend on them,” said the study’s lead author Sarah Durant of both the Wildlife Conservation Society and the Zoological Society of London. The study’s authors say that more conservation support and scientific attention needs to be paid to deserts. They note that 2014 is the halfway point in the United Nations Decade for Deserts and the Fight against Desertification and the fourth year of the United Nations Decade for Biodiversity. “The scientific community can make an important contribution to conservation in deserts by establishing baseline information on biodiversity and developing new approaches to sustainable management of desert species and ecosystems,” Durant said. The authors note that some governments have recently made large commitments to protecting the Sahara and its remaining wildlife. Niger has just established the massive 97,000 square kilometer (37,451 square mile) Termit and Tin Toumma National Nature Reserve, which shelters most of the world’s estimated 200 remaining wild addax and one of a few surviving populations of dama gazelle and Saharan cheetah. There is also hope that the scimitar horned oryx may be reintroduced in the wild in the Ouadi Rimé-Ouadi Achim Game Reserve, with the support of the Chadian government.